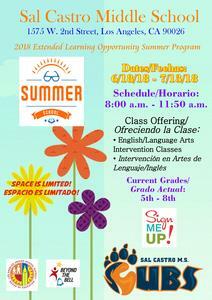 Summer School is designed to help students meet grade level standards in English Language Arts. They will be going on a couple of field trips as well, to the Bowers Museum of Cultural Arts and American Museum of Ceramic Art. Students enrolled in Summer School will receive a confirmation letter of their enrollment and other important information by Tuesday, June 5th, 2018. If you would like to enroll your child in Summer School, please contact Mrs. Ramos at 213-241-4416 or stop by in room 504.